Thank the person that nominated you and link to their blog. 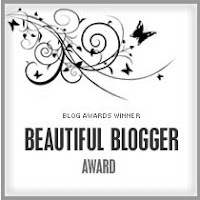 Thank you to Amie at Belle Amie Beauty who nominated me for this award! i really love her blog so definitely check it out! Tell us how the idea of making a blog popped up and what makes you continue it? I had been reading blogs for about two years when I decided I really wanted to make my own! Getting comments from people who read it makes me carry on and the fact I love blogging! Describe a usual day in your life. When I'm at college my day is pretty boring! Otherwise I am at work or watching as many Dexter episodes as I can squeeze into one day! The best collaboration with a blogger. I haven't had a collaboration yet. The worst collaboration with a blogger. Describe what having a blog means to you. It's my place where I can express how I feel and talk about what I want, it's also a place where I can interact with other people and other bloggers! And if you haven't done so, check out their blogs! Hi Georgina! We found you through Amie nominating us both for this award along with you:) So glad b/c you have such a cute blog!! New followers!